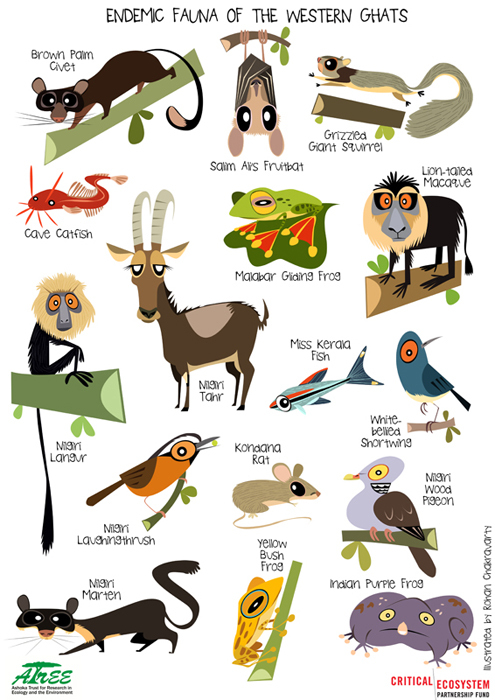 A poster illustrated for ATREE- CEPF with caricatures of the endemic fauna of the Western Ghats that the prolific Bangalore-based NGO funds research on. The illustrations were created for a workshop conducted by ATREE in June 2015, and were printed and used as posters and coffee mugs. Working on these illustrations gave me a chance to get to know some animals like the Cave Catfish, the Kondana Bush Rat and the Miss Kerala Fish, that I had never heard of before! The lot also includes some elusive, spectacular and even bizarre creatures like the Brown Palm Civet, the Salim Ali's Fruit Bat, the Yellow Bush Frog, the Malabar Gliding Frog, the Nilgiri Langur, the Grizzled Giant Squirrel, the White-bellied Shortwing, the Nilgiri Laughingthrush, the Nilgiri Marten, the Nilgiri Tahr, the Nilgiri Woodpigeon, the Indian Purple Frog and the Lion-tailed Macaque. A big thanks to Dr. Bhaskar Acharya for commissioning me for the project and for associating me with CEPF and ATREE!